On the Town + Virgil's BBQ + free = best Memorial Day ever. 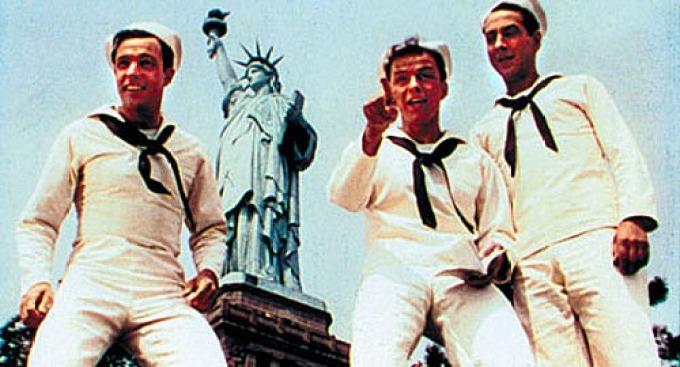 HELLO, SAILOR: Seeing servicemen in their whites around town this time of year always makes us think of On The Town, that 1949 classic where Frank Sinatra et al play sailors exploring (where else?) New York during (what else?) Fleet Week. The city screens it free in Times Square -- complete with complimentary BBQ from Virgil's. 12PM. I LOVE A PARADE: Kick off summer in a blur of marching bands and red, white and blue with New York's various Memorial Day Parades, one of the big city's delightful small-town pleasures. Get info on parades in Staten Island, Brooklyn, Manhattan and City Island here. UNDERGROUND MUSIC: For its 11th Annual memorial Day Concert, Sunset Park's Green-Wood Cemetery presents the ISO Symphonic Band performing "New York's Buried Treasure," a program of works composed by residents of the storied resting place (Leonard Bernstein, Fred Ebb). Bonus: It's free. 2PM. STRIPES: You know what makes us feel patriotic? Bill Murray movies. Williamsburg's Huckleberry Bar knows of what we speak; they're organizing a Memorial Day salute to the man himself with screenings of two career highlights Caddyshack and Groundhog Day. They'll also be grilling burgers and bratwursts and serving up Murray-themed drink specials. 4PM.